After having a couple days to digest the Penn State game, I've come to one conclusion. I'm done caring about style points. I don't care how Michigan does it. I don't care if we roll out two or three offensive schemes per game. I don't care if Michigan loses 3 yards on first down, just as long as they get 14 on the next 2. 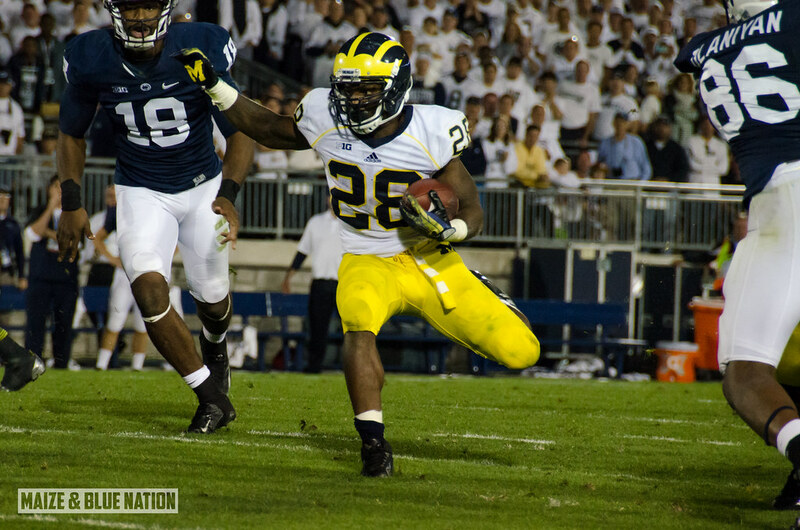 I don't care if Devin Gardner is our leading rusher and the decimated OL is held together with scotch tape. Just win. Do whatever it takes to win. As so many teams have proven over the years, winning by 50 or winning by 1...it really doesn't matter. Winning saves everything. Just ask Ohio State... the undisputed king when it comes to finding ways to win. It can be ugly, but a win is a win. And once the ink has dried on the box score, who gives a damn how it happened. Beating Akron by 3...sure it looks bad when it happened, but in week 14, it's just another check in the win column. If Brenden Gibbons knocks in one of his field goal attempts, then we're all sitting here complaining about a team that is ultimately flawed, but still 6-0. I don't put this loss on Gibby, either. But I'm completely fine with flawed. I can live with flawed. Because who really cares? Everyone is flawed. If Devin Gardner throws 2 pics, but then completes 15 for 240 yards and 3 touchdowns, and runs 24 times for 121 yards...and Michigan wins...then who cares if Fitz runs 27 times for 27 yards? A flawed team can still be okay if they find ways to win. And ultimately, that comes down to coaching. If there's one legit concern moving forward, it has to be the coaching decisions. Why, oh why, did they not call timeout before the delay of game penalty on the last drive of regulation? Those 5 yards were the difference between a Matt Wile punt and a Matt Wile field goal attempt. I'm a little surprised they didn't attempt a FG anyway. If Penn State gets the ball back with 57 seconds at the 20 or the 35...it's not that much of a difference, and I think, worth the risk to extend the lead back to 10 points. The fact that no one on the sideline was keeping an eye on the play clock is a fundamental breakdown. Plain and simple. That's on Hoke. Playcalling was a mess at the end of regulation and in overtime. Michigan went ultra-conservative and it killed them. In 4 overtime periods, Michigan, who ranks 17th in the nation in redzone touchdown percentage, didn't throw even once into the endzone. I get that in the first and third overtimes, when your defense got the stop and all you needed was a field goal, then you play for the field goal. But in the 2nd and 4th overtimes, no excuse. Put the hammer down and win the game. They wasted so many downs trying to resurrect a diseased power running game. Michigan pounded away with Fitz and an offensive line that had zero punch. I don't understand that rationale at all. But even then, it almost worked. In maybe the most raucous and amped up road environment I've ever witnessed, Michigan had battled back from a first half rife with mistakes and an 11-point halftime deficit. They outscored Penn State 24-3 in the second half to take a 10 point lead. 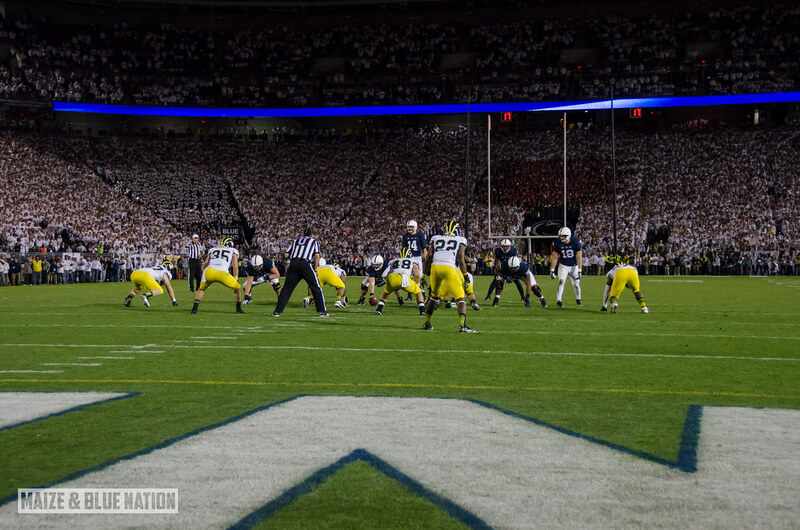 They had taken the crowd out of the game and put their foot on Penn State's throat. All they had to do was not let up. But they did. Man, I don't even know. In the second half, the lineup was (L-R) Schofield, Burzynski, Glasgow, Kalis, Magnuson. I know these guys are probably pretty good, but Saturday night was a trial by fire...which I'd like to point out again, was a pulled field goal attempt away from actually resulting in a win. That fact seems to keep getting lost in the aftermath of all this. As tough as it was to see Lewan pacing on the sidelines without his helmet on, trying to convince and reason with anyone wearing a coaches shirt to let him back in the game, my hats off to the training staff for keeping him safe. 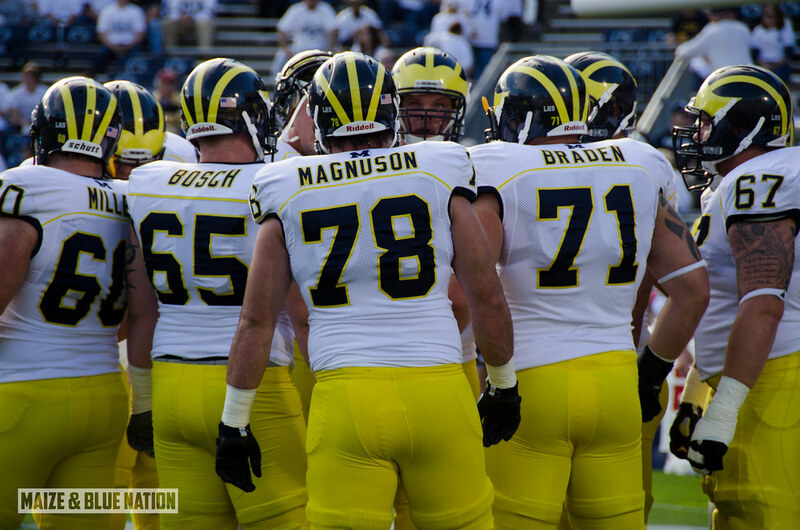 There are bigger games that Michigan is going to need #77 back for. What else can I say? These guys are young. It's a worn out excuse, I know. And maybe the heat is starting to get turned up on OL coach Darrell Funk. And if that's the case, then it's time to start to see some real development of all this talent. I think the talent is there, it's just not being utilized. I think the time is now to say either Michigan is going to be a read-option offense, or they're not. I think when the staff sat down to watch game tape yesterday, I hope it was obvious which scheme fits the personnel better. Like Denard, Devin is a weapon worth utilizing...which he's even more dangerous because of his throwing ability. Devin is not a power QB. Fitz is not a power back. And it would seem that the OL is not a power OL. Stop trying to make the power running game happen. It's not going to happen. 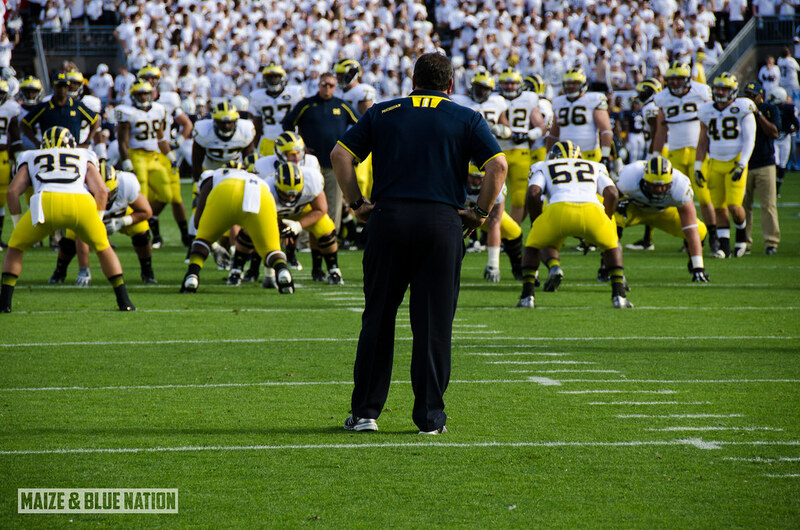 This is the first time in Hoke's career at Michigan that he's taking measured criticism. And I don't have any problem with that. If you spend any amount of time listening to radio shows or go on message boards, then you've heard the comparisons to Rich Rod. I do think that's insane. Hoke and Rich Rod are worlds apart. But now is the time when Hoke must keep his team focused. How Michigan responds in the next game and down the stretch in November will determine the next steps in Hoke's tenure at Michigan. This was not a season-ending loss. I guarantee the winner of the Legends division will have at least 1 loss. Michigan still controls it's own destiny. If that doesn't keep the troops focused, nothing can. 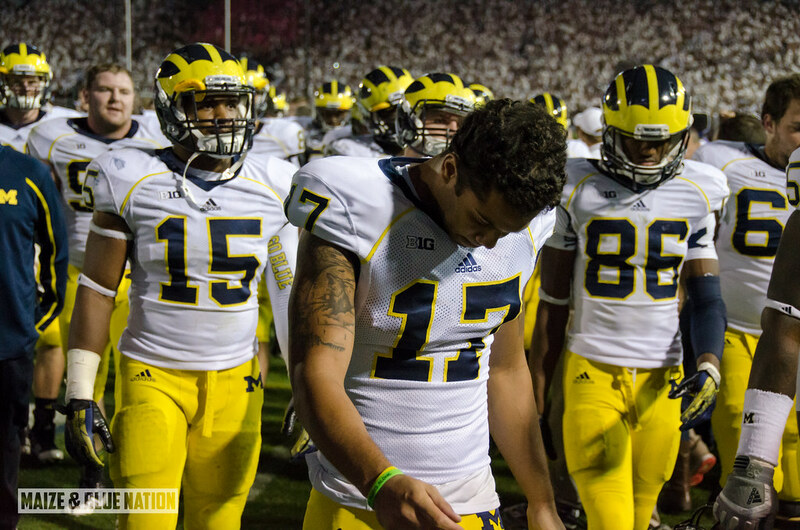 This can be a season-defining loss, but only if Hoke and his staff allow it to be. They can't let that happen. Devin threw two bad INTs in the first half which set up two Penn State touchdowns that I don't necessarily put the blame on the defense for. Take away the points off turnovers, and Michigan only gives up 20 points in regulation. That's the ball game, folks. Like I've been saying – Stop the turnovers, receive bacon. Nice to see the defense get more pressure on the QB. Coverage on Allen Robinson, by-in-large, was great. PSU only ran the ball for 85 yards. And how great was it to see Jake Ryan back? I have a real problem with going into a prevent at the end of the game. It didn't work, first of all. 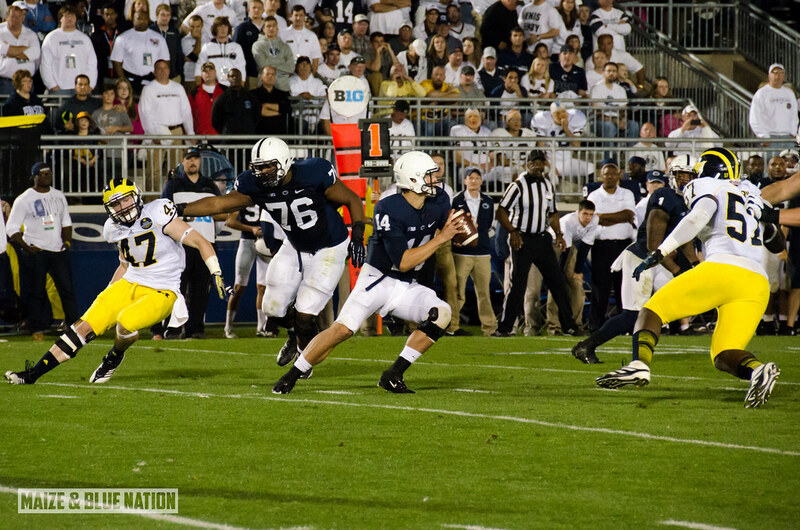 Hackenberg made some awful throws into coverage. But he had time to do it. The coverage was there, but for reasons passing understanding, Penn State players came down with the ball. A couple awfully-timed jumps to try and make interceptions didn't help. I'm okay with the desire to want to end the game with a knockout INT, but if nothing else, just knock the ball away and live to fight another down. I will say that Happy Valley is a really beautiful place (even though it's in the middle of nowhere) and I thought, overall, it was a good trip. When Michigan goes back in two years, I highly suggest making the long trek. The Penn State fans were great to the group of M fans I was with. I overheard many times in the parking lot how impressed PSU fans were with how many Michigan fans were there. I was a little taken back with how defeated the fanbase seemed as a whole. You could tell they had just gotten blown out by Indiana. Almost everyone I spoke to assumed Michigan would win. But you wouldn't have known that once you stepped foot inside Beaver Stadium. Those fans brought it Saturday evening. I've seen some big college atmospheres since I've started covering road games, but I don't think I've witnessed a more psyched up crowd than Penn State's. The white-out was truly a spectacle to see. The pressbox, which I think was built right after the war, literally swayed back and forth when the crowd got going. I've never felt anything like that before. I won't lie, it was frighteningly awesome. As I made my way down to the field for the final few minutes of regulation, I saw some white shirts streaming out of the stadium towards the gates. I was a little shocked to see this. I wanted to stop them and tell them that this game is far from over. Haven't they heard of a prevent defense? Excellent post. Keep up the good work! Yeah I really enjoyed your write up, just as Im really enjoying your blog Senor Brad. Michigan played well in the secondary, I almost wonder if they should have gone to a press man on a cover 2 base instead of the prevent. I understand the rationale, but it certainly didn't work. Glad you enjoyed the game at Beaver Stadium, one of my own favorite venues for sure.